The application of quantum theory to cosmology raises a number of conceptual questions, such as the role of the quantum-mechanical notion of "observer" or the absence of a time variable in the Wheeler-DeWitt equation. I point out that a relational formulation of quantum mechanics, and more in general the observation that evolution is always relational, provides a coherent solution to this tangle of problems. Testable predictions of quantum mechanics are invariant under time reversal. But the change of the quantum state in time is not so, neither in the collapse nor in the no-collapse interpretations of the theory. This fact challenges the realistic interpretation of the quantum state. On the other hand, this fact follows easily if we interpret the quantum state as a mere calculation device, bookkeeping past real quantum events. The same conclusion follows from the analysis of the meaning of the wave function in the semiclassical regime. didn't seem to me to make much sense. Both papers address (may actually solve) some problems at a philosophical level. The role of the observer, and time, are long-standing puzzles in cosmology. John Barrow, Joe Silk, and Simon Saunders are major figures in cosmology and in foundations/interpretation of quantum theory. It is interesting that they are assembling and editing a book on Phil. of Cosmology and have included this paper by Vidotto. Some of us watched parts of the Oxford 2013 conference on Cosmology and Quantum Foundations. As I recall it was Dandelion who found and passed along to us the link to those videos. Some were pretty remarkable. God did not over-fill the world with moving waves on infinite dimensional configuration spaces. She didn’t even draw it with heavy continuous lines. She just dotted it with sparse quantum events. 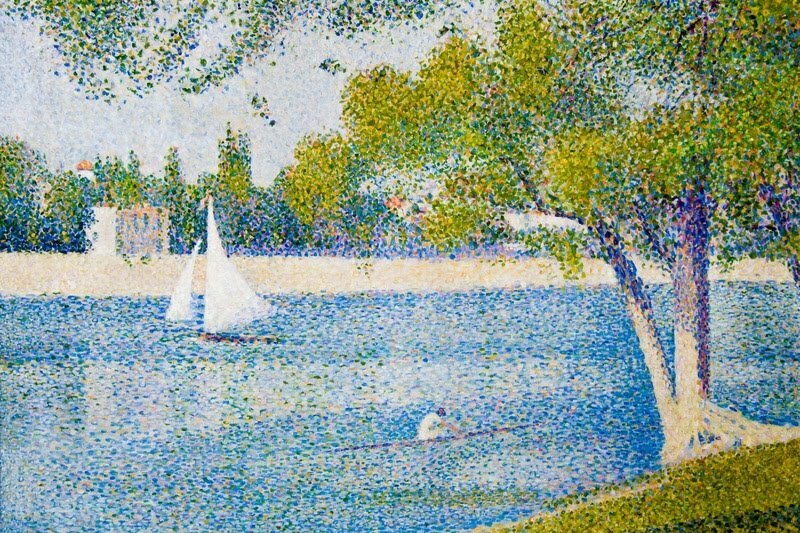 At the end there is a 19th century French pointillist painting of a sailboat made with dots of light (photon events if you like) I wish I could find an online copy somewhere. There is also a more famous painting of the shore at La Grande Jatte, with many people in various attitudes enjoying the space and the weather. But this painting is mainly just of the river, as the title indicates. "She just dotted it with sparse quantum events." this is the core idea of event-based interactive ontology, or interactive quantum Realism. I don't know what else to call it. We had some related threads. It's not good (and it leads to contradictions and paradoxes) to fill heavy continuous "reality" in between interactions/events. that is overloading, making an excessive ontology. I can't do an adequate job of paraphrasing. the paper is only 4 pages and it's written to be clear and accessible. Better just read it. Maybe what's emerging in this and similar papers could be called the pointillist interpretation of quantum mechanics. Excellent paper. But something about the discussion of T- invariance bothered me. Regarding the beta decay example. Will read further and get back this weekend when I'm fresher. But really, QM is at its core about discreteness. If it's not Seurat, it's not real QM. The whole continuous evolution of the state vector thng, always gives me indigestion. Midnight here, I'm looking forward to hearing more of your thoughts about this in morning. turning in now. I agree about the continuous evolution of the state. useful book-keeping device for us but maybe not the real way she operates. Sleepy. must turn in. Glad you dumped that rude so-and-so. I guess the beta decay example works....the electron only manifests, is only "real" when there is an interaction. In relational QM, there really is no quantum state...and in cosmology, by extension of this concept, there is no universal quantum state. In the beta decay example, there is no concern about an imagined time-reversal where an electron wave evenly contracts around a nucleus, because you don't really have an interaction for that. So no need to fret that there's no way to codify a T-negative electron wave collapsing into a nucleus. The only interaction is the electron and the atom in the Geiger counter....that is where the electron is manifest and real, in a relational view. Forget the radioisotope emitter, forget the larger universe. So we get back to a 3D space with sparse quantum events, a pointilist ontology. I think this makes some sense, even if I can't wrap my head around where gravity fits into the cosmological picture. I was reading about these and thinking about how some observer interactions can be extended and controlled for a long time, where a massive quantity of events is handled with a continuity function that allows the best "bookkeeping" for the probability of where the electron field is strongest. We need the continuity of fields, in a pointillist universe, or there is chaos. We need to know what observer expectations should be. Had forgotten this thread. Thanks for reminder, Dandelion.